This buttery pound cake gets its pleasant crunch from cornmeal and its rich aroma from brown sugar. You can make the cake the day before serving and store it at room temperature, or up to a month in advance, put it in waxed paper and a zippered plastic bag, and freeze it. Preheat oven to 350°F (180°C). Grease and flour one 10-inch tube pan or bundt pan or two 4 1/2-by-8 1/2-inch loaf pans. In a bowl, sift together the flour, cornmeal, baking soda, and salt. (If any cornmeal remains in the sifter, just stir it in.) In a small bowl, combine the sour cream and vanilla and almond extracts. In a large bowl, using an electric mixer on medium speed, beat the butter until creamy. Add the brown sugar and beat on high speed until lightened, 4-5 minutes. Add the egg yolks, one at a time, beating well after each addition. Reduce the speed to low and add the cornmeal mixture in 3 batches, alternating with the sour cream mixture in 2 batches, beginning and ending with the cornmeal mixture. In another bowl, with spotlessly clean beaters, beat the egg whites and cream of tartar on medium speed until soft peaks form. Gradually add the granulated sugar and beat until the peaks are stiff but not dry. Stir one-third of the egg whites into the batter to lighten it, then, using a rubber spatula, gently fold in the remaining whites. Scrape the batter into the prepared pan(s) and spread evenly. Bake until a toothpick inserted in the center comes out clean, approximately 70-90 minutes. Invert the cake(s) on a wire rack, turn right side up, and let cool completely. Dust with confectioners’ sugar before serving. This was a very tasty pound cake-a nice twist on the usual pound cake. I would advise that you cover it with aluminum foil the last 10-15 minutes of baking, because the crust browns too much before the cake is done. Also, the recipe didn't tell you how long to bake it for, so I just watched the cake closely. It ended up being somewhere around an hour....I didn't really notice what time it was when I put it in the oven. Overall it was very good. I've made a Brown Sugar Pound Cake similar to this one numerous times using 3 cups all-purpose flour, 1 cup granulated sugar, no cream of tartar and 1 cup evaporated milk (instead of sour cream), (otherwise everything else is the same). 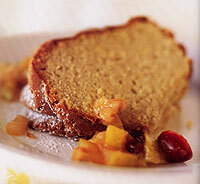 THIS is a wonderful, different and moist pound cake. I also added a caramel sauce and pecans for the topping. What a wonderful cake that is praised by all. I followed the recipe to the T, separated the batter into 2 square pans, used fan forced at 170C and it took exactly 50 minutes. While the top is nicely browned, the cake turned out in a rich gorgeous yellow hue, so moist, extremely tasty and not too sweet or heavy. Thanks Diana for another great recipe from you. Rgd-Doris Tan from Singapore.